It is 1841. Patty is married to John Clare: peasant poet, genius and madman. Travelling home one day, Patty finds her husband sitting, footsore, at the side of the road, having absconded from a lunatic asylum over eighty miles away. Hopeful that his condition has improved, she takes his hands in delight but he fails to recognize her. She is devastated to discover that he has not returned home to find her, but to search for his childhood sweetheart, Mary Joyce, to whom he believes he is married. Patty still loves John deeply, but he seems lost to her, obsessed with the idealised image of a woman that she cannot possibly match. Plagued by jealousy, she seeks strength in memories: their whirlwind courtship, the poems John wrote for her, their shared affinity for the land. She must try to heal John’s turbulent, unhappy soul and restore him to the man she married. But as John descends further into delusion and his behaviour becomes increasingly volatile, hope seems to be fading. Will she ever be able to conquer her own anger and hurt and reconcile with this man she now barely knows? A fascinating, compelling book about the wife of John Clare, and the bewildering effects of her husband’s madness. John Clare has been described as ‘peasant poet, genius and madman.’ In his latter years his sense of identity fragmented so that sometimes he thought himself to be Admiral Nelson or Byron or a boxer called Jack Randall. In the millennium year I was involved in an arts project that took me into Northampton Library to research local literary figures. There I read John Clare’s letters from the local asylum where you could trace his heartbreaking decline into madness. He spoke of ‘living among the Babylonians’ and all the people’s brains being ‘the wrong way round’. It moved me and began my interest in John Clare not just as a marvellous poet and naturalist but as a man. I began to wonder about his family. I found out a lot about John but very little information was available about his wife Patty Turner. I found out that John remained obsessed with his childhood sweetheart, Mary Joyce, and believed himself twice married, to both Patty and Mary. What must it be like to be married to a man, have nine children with him, two of whom die as infants, and then find that you are losing him to his illness and to his delusions about another woman? This was something I just had to write to find out. I decided to give Patty a voice and the poet’s wife began to tell her story. 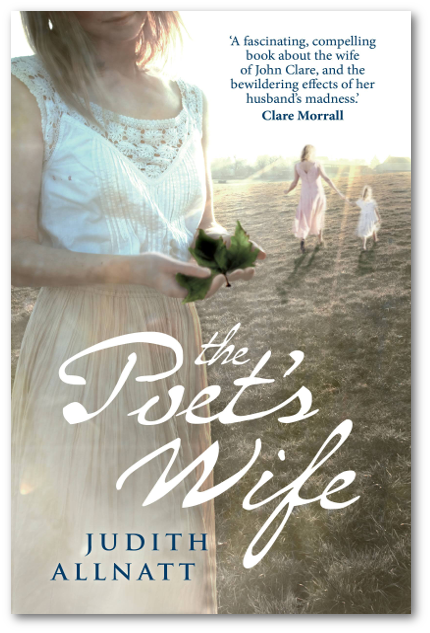 The Poet’s Wife is a fictional account of Clare’s mental disintegration and especially of the effects of his illness on his family. Narrated by Patty, this is a subtle and sympathetic portrayal of losing a loved one to mental illness. Patty’s voice is at once homely and poetic, and her lyrical descriptions of the rhythms and customs of mid-nineteenth century England – where it is unlucky to look at the moon through glass, and where a bundle of corn is left in the field at the end of every harvest, like an offering to the gods – are at the heart of the novel. Through these evocations of her country girlhood, questions arise about her relationship with John. Is it just Clare’s illness that has triggered his obsession with Mary? Has he only loved Patty with “part of his heart”? 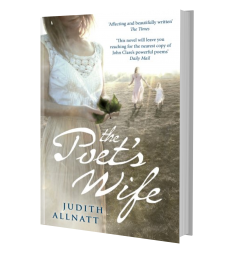 That the answers are never quite clear, even to Patty, is what makes Judith Allnatt’s novel memorable. Set against a backdrop of changing times as industrialisation runs roughshod over the traditions of the countryside, this novel will leave you reaching for the nearest copy of John Clare’s powerful poems. The poet is the great John Clare, the first “people’s poet”, who wrote so beautifully about love and nature and went insane. One day in 1841 Clare escapes from the asylum and comes home – but he thinks he has married his childhood sweetheart, Mary, who has been dead for three years. His real wife, the long-suffering Patty, is baffled – she thought she had married an ordinary farm labourer, and struggles to understand her husband’s genius and his madness. She still loves him, but he does not recognise her or their children. Clare often pops up in fiction, but it was high time someone rescued his poor wife from footnote-land. Allnatt (herself a poet) gives her an affecting, beautifully written afterlife. There is an old saying that genius is only one step from madness… And when that boundary is crossed and a once gifted brain has become mired in its own delusions, what happens to those who are their nearest and dearest? This is the fascinating conundrum posed by Judith Allnatt in her exquisitely detailed evocation of the devastating obsessional illness that haunted the latter years of 19th century peasant poet John Clare. This is a beautifully written, poignant novel, lyrically descriptive of the landscape, detailed in the country life of the time and reminiscent of the gentle style of the genius peasant poet. This is a fascinating, compelling book, written with subtlety and a delicate touch. It is a tender family portrait, weaving together the daily struggle and acute observations of the woman who was married to John Clare and the bewildering effects of madness at a time when mental illness was little understood. The novel is brimming over with convincing details about rural life in the nineteenth century. Through the eyes and language of his wife, we can see, smell and feel the rich beauty of the countryside which inspired the poet.